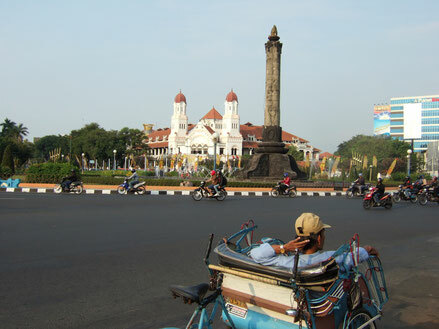 Semarang is the capital of Central Java province, Indonesia and the fifth largest metropolitan city in Indonesia after Jakarta, Surabaya, Bandung and Medan. Semarang city also dubbed by city Jamu, save a million charm of a tourist attraction that you can visit both personal and group. Tourist Attractions in Semarang that you can visit is MAJT or Great Mosque of Central Java. This mosque is one of the religious tourism is built on a land of 10 hectares was built on September 6, 2002, the building area of the parent to pray at this mosque area of 7,669 square meters. This mosque is one of the largest mosques in Indonesia. Tourist Attractions in Semarang Lawang Sewu The second is, if you come to this Jamu City, for the first time, make sure you visit Lawang Sewu. The location of this place is exactly right the heart of the city of Semarang. Lawang Sewu is right overlooking the Tugu Muda and Tourist Attractions in Semarang. This place was once a magnificent Art Deco-style building, and is used as a government building and the central railway station. Besides the uniqueness of this place is hundreds of doors, photographs of the architecture of the past, and that is no less interesting is the dungeon phenomenal .